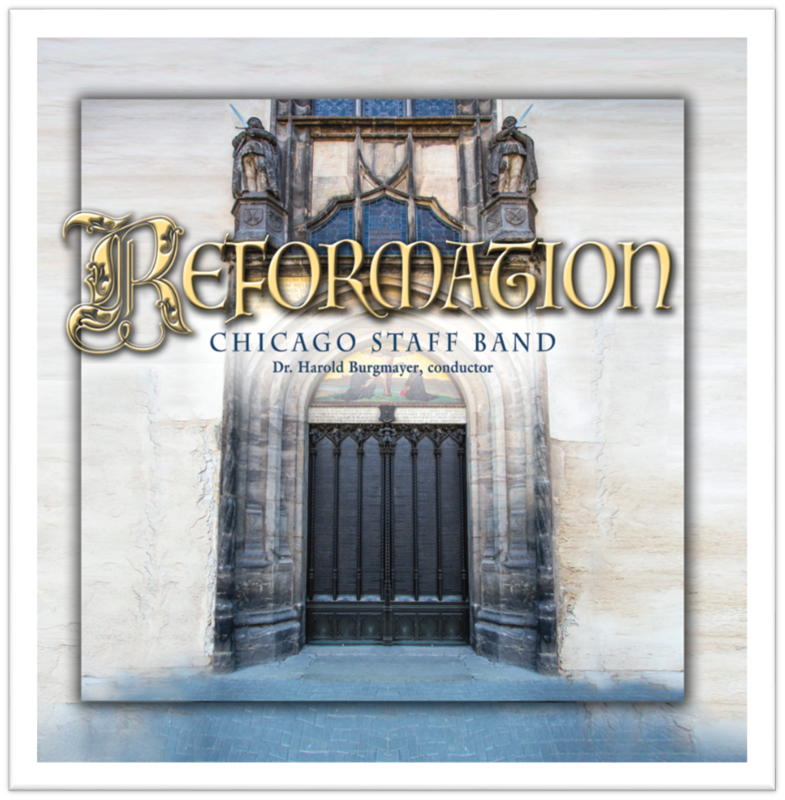 Gospel Arts - CSB Releases New Album - Reformation! The opening track on this album is the effervescent Festival Prelude -Raise the Song by Simon Morton. This new and exciting work, features Henry Alford’s hymn tune Come Ye Thankful People Come, performed with energy and excitement. Darren Shaw’s evocative meditation, Guardian of My Soul, combines the composer's own song I worship You with the well-known hymn O Jesus, I have promised; both of which contain the phrase "guardian of my soul." Here the sonority of the warm middle of the band shines through particularly well. The fourth movement of Felix Mendelssohn’s Symphony No. 5 - Reformation, is a paraphrase of Luther’s Reformation Hymn A Mighty Fortress is our God. This well-scored arrangement, by Dr. Harold Burgmayer, commences with the lone sound of Principal Cornet Beth Cooper, and leads to a thrilling climax through the development of many great sonorities and use of color. The trombone section, led by Principal Trombone Brett Tolcher, features Australian Brenton Broadstock’s pastoral setting My Shepherd. This seldom-heard work sets a calm mood for the listener through its masterful writing and scoring. The tuba duet, The Radiant Pathway, by the late Leslie Condon, is a set of variations based on an old American gospel song Walk in the Light. The duet laughs its way through moods of radiant joy and other subtle references to sunshine. In this fine performance, we hear the balance of Euphonium (Josh Turner) and Eb Bass (Paul Bowyer) come across well, despite the obviously perceived differences in timbre. The Chicago Staff Band has a fine tradition of vocal expression, which is an integral part of their ministry. A Chasing of the Wind (Greg Nelson and Phil McHugh, arr. Burgmayer) is effectively enhanced by Peggy Thomas and Lynda Cooper on flugelhorns. Grace (arr. Mark Hayes) opens with a euphonium soliloquy, performed by Principal Euphonium Josh Turner, growing to a heartfelt climax of the familiar words by John Newton. Both of these vocal items add greatly to the missional impact of this recording. The band moves into the swing idiom with a superb arrangement based on John Philip Sousa’s famous march The Stars and Stripes Forever (arr. Dave Wolfe). This listener was impressed by the adaptability of the band in this style, in particular, the middle of the band, led by Principal Horn Major John Aren. Soprano Cornetist Marc Smith handles the piccolo obbligato with ease. In stark contrast, Dr. Burgmayer’s artisan treatment of the song setting Tis So Sweet is performed with a warmth and sonority, particularly evident in the climax. English composer Paul Lovatt-Cooper (PLC), is associated with the world famous Black Dyke Band. Lovatt-Cooper has many exciting concert works in his portfolio, bridging both the secular and Salvation Army band movements. Power and the Glory is a cinematic expression of praise, using the hymn All Hail the Power of Jesus’ Name and the contemporary song At Your Mercy Seat. The album closes with Dr. Burgmayer’s arrangement, Can You Dig It?, based on Lamm & Pankow’s music from the 1960’s rock group Chicago. The delightful sounds of Lynda Cooper (flugelhorn) and Meghan Pierson (piano) carry the listener into four of Chicago’s top hits, including Colour My World, Make Me Smile, Does Anybody Really Know What Time It Is? and Saturday in the Park. Reformation is available on iTunes, Spotify, CD Baby and shop.salvationarmy.org.